Local growers, real whole foods, balanced nutrition, and health you can see. All created in their own kitchens! Merrick provides real, wholesome recipes using USDA-inspected deboned meat and fresh produce for industry leading levels of protein, glucosamine and chondroitin. 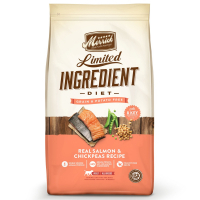 With uniquely crafted recipes including high protein, grain-free, limited ingredient diet, and more, Merrick is committed to ensuring your pet is provided with the unique recipes they deserve. Handcrafted in Hereford, Texas, by farmers they know and trust. Merrick never contains additives, sweeteners, colors or preservatives. Real whole foods including high quality meats and fresh caught fish are the core of every Merrick dog and cat food. Shop their full line of Dog & Cat food and treats!